We are having our first volunteer meeting – we hope you can join us on Thursday, February 11th at 7pm at the Chelsea Senior Center! I hope everyone is enjoying this unseasonably warm winter – while we’ve missed family sledding activities, I have not missed using the snow shovel. Our broadband group is approaching a milestone – our first volunteer meeting! As someone who has expressed interest in helping to improve broadband in our area, we hope you will consider joining us on Thursday, February 11th at 7pm–8pm at the Chelsea Senior Center. At this meeting we will discuss 2016 goals for the group, and divide into committees to accomplish these goals. Even if you can’t attend the meeting, you can still let us know you’d like to help by filling out this form. We’d also like you to be among the first to know that we are changing the name of the organization from Pure Broadband to the Michigan Broadband Cooperative to more clearly represent our mission. We will launch the organization with this new name in the following weeks with the help of our volunteers. Finally, we are now able to accept donations. All of our board members are unpaid volunteers, so 100% of donations will go to accomplishing our mission. Please note that while we are a non-profit organization, donations to cooperatives are not tax deductible. Donate here! Thanks for your attention – it is through our joint community effort that we will continue to make progress toward our broadband goals. If you’re one of the residents in Washtenaw and Jackson Counties with poor broadband, you may be visiting this website and thinking “why haven’t I heard of this group sooner? ?” There is a good reason for that – although a few of us have been talking for several months now, we’ve only just settled on a name and put up a website. So, you’re not late to the party, you’re just in time to help us get rolling! 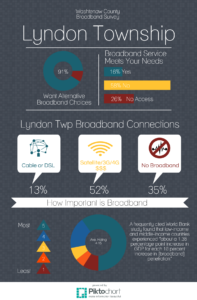 Michigan Broadband Cooperative is made up entirely of community members from Washtenaw and Jackson Counties, with one simple goal – broadband for all of us. 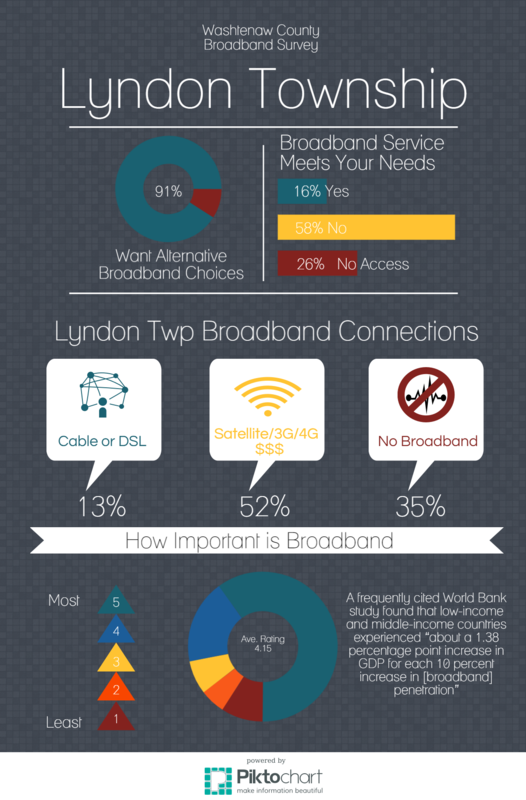 We’ve talked to the cable and DSL companies, and they aren’t going to run cables to our communities – too expensive. We’ve talked to the cellular carries, and their services either lack coverage, have data caps, or both. We’ve talked to our friends at the local wireless ISPs, and they are currently our best bet – but their wireless solutions are only a bandaid on the problem. We need an organized community effort to bring robust broadband service to our unserved and underserved areas – and Michigan Broadband Cooperative is that effort. We hope you will join us as we move forward with tangible efforts to bring broadband to our community, with the long term goal of gigabit fiber to the home.